1.5 What parts of mullein are used and how? Common mullein (Verbascum thapsus) is a plant of European origin that is characterized by its hairy leaves and its long floral stem, where small and showy yellow flowers are arranged. There are different species of mullein (Verbascum spp. ), And all of them share the medicinal applications mentioned below. Verbascum genus is considered a suitable genus of plants to treat the respiratory system. Indeed, the balsamic virtues of mullein were already known in ancient Greece and appear in treatises of Hippocrates and Dioscorides. Mullein has the property to soften the bronchi, it is expectorant and demulcent of all the tissues of the body. In English, mullein is also called bullock’s lungwort, cow’s lungwort, clown’s lungwort (“herb for the lungs of bullocks, cows or clowns”) because it cures the pulmonary diseases of cattle and people. Usually their flowers are used for internal use, to treat colds, bronchial congestion, asthma and allergies. Photo of mullein during the first year, when only the basal leaves develop. Its flowers are gathered between June and September, first thing in the morning. The corolla is collected without the calyx, very delicately not to damage the petals. Flowers are dried in the shade. Dried flowers have a lighter yellow hue, and, if they are chewed, they have a mucilaginous texture. The leaves of mulleins are usually crushed and used externally, in poultice, plaster or oil, on scab, burns and hemorrhoids. Because of its mucilage content, it has a demulcent and emollient effect on the skin. What parts of mullein are used and how? Flowers are the used parts by means of internal application. They are applied in infusion. Mullein leaves also contain active principles, in smaller amount, although their dense hairiness hinders their internal use. It is important to strain the infusions with filter paper to remove the tiny stamens from the flowers. The stamens and the calyx of the flowers contain tiny hairs, which can be irritating to the airways. Cough, sore throat: Mullein is a traditional plant against colds and lung congestion. Its therapeutics are justified by the presence of saponins, mucilage and iridoids with antispasmodic, anti-inflammatory and analgesic effects. The infusion of mullein acts by reducing the formation of mucus and stimulates the cough with phlegm, constituting a specific treatment for bronchitis and tracheitis. In infusion, flowers are a remedy for treating respiratory irritations, such as pharyngitis, laryngitis and colds. It is even used to alleviate some symptoms in the treatment of tuberculosis. Because of its antispasmodic and bechic activity, it is effective to try to relieve cough and to treat the persistent cough. The saponins it contains have a mucolytic effect. (Infusion of flowers, strain, and serve sweetened with honey). Mullein combines well with other expectorant plants such as coltsfoot (Tussilago farfara) and thyme (Thymus vulgaris). 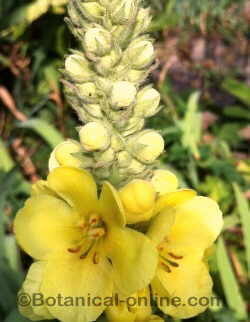 Asthmatic bronchitis: Mullein flowers are rich in aucubine, an active substance with antiallergic effect. Infusions of flowers have been used to treat asthmatic bronchitis. COPD (Chronic Ostructive Pulmonary Disease): Infusions of flowers have been used to treat COPD. (Infusion of 10-30g of flowers per liter of water, let stand 10 minutes and strain with filter paper to remove stamens from flowers). Hoarseness: Having a lot of mucilage, with emollient and demulcent effect, this plant is able to soften the tissues of the body. Infusions of flowers are applied against hoarseness. Intestinal disorders: Saponins contained throughout the plant have antienteric and astringent components, which have been used to treat diarrhea and gastroenteritis. Because of their diaphoretic qualities, they stimulate sweating and are an aid in febrile states. Diuretic: Saponosides and flavonoids confer it mild diuretic properties. Deafness, earache and simple hearing suppurations: Traditional remedy for otitis and hearing loss, consisting of applying a few drops of mullein oil to the ears. It is a remedy with mild antibiotic and anti-inflammatory properties. It is also used for tinnitus or buzzing in the ears (Mullein oil: macerate 20g of flowers in 40ml of extra virgin olive oil for 2 weeks, apply 2 drops in the ears). Contraindications: If your ear hurts, pull the ear lobe. It this action increases the pain, it can be a symptom of infection, in which case you should visit a doctor. Also do not use these remedies if you have a ruptured eardrum. Sore throats: Gargles are used to treat throat irritations. Meniere’s disease: The previous treatment can also be used to use whistles in the ears. For skin conditions: the leaves of the plant are widely used as a vulnerary because of its high content of mucilage (demulcent and emollient). The plant inherits its skin curative applications from the time of Dioscorides, in which it already appears quoted in its writings with such properties. It also has saponosides with activity of natural antibiotics of the affections of the skin. To make this effective, the leaves are crushed and boiled in milk. They are used as poultice, or the infusion of milk in compress, to treat boils, abscesses, burns, chilblains and hemorrhoids. Burns and chilblains: apply a flower pack of mullein (Decoction of 3 g of flower corollas per liter of water) or plaster of leaves boiled in milk (infusion of 40 g of leaves per liter of milk). 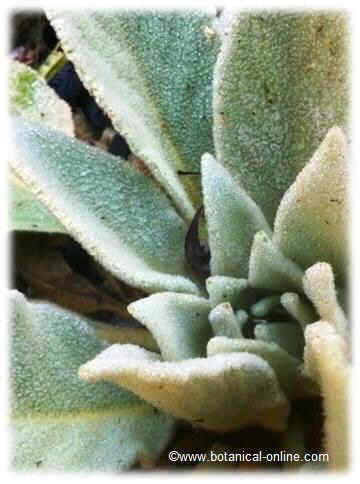 Hemorrhoids: the leaves of mullein are used in the topical treatment of hemorrhoids. It can be applied in oil (20g of macerated flowers in 40ml of olive oil, or: cataplasm of leaves boiled in milk, two or three times a day). Cellulite: the oil of mullein or the plasters of leaves can help to treat cellulite due to its antibiotic properties. Wound healing: the leaves of mullet applied in plaster have shown properties to stimulate wound healing, and are a popular remedy in traditional Turkish medicine. Scientific studies corroborate these properties in different genera of mullein (Verbascum spp.). Caution: choose fresh, clean plants that have not been contaminated by animals or chemicals (pesticides, herbicides, etc.). Due to the dense hairiness of this plant, it is especially difficult to clean it from contaminants, so it is important to take care to choose healthy and clean specimens. It is only recommended to use the internal flowers of the plant. Leaves are not edible and contain irritating hairs. Infusions: It is prepared with 10-30g. of flowers per liter of water. Leave it to stand for 10 minutes and strain into strainer or filter paper. It is important to strain the infusion to remove the stamens from the flowers. Between 2 and 3 cups daily. Dry extract: 0.5 – 1g., Up to 3 times a day. Mother tincture: 40 drops, three times a day. Compress: prepare a decoction of 3060g. of leaves and flowers per liter of water. The compress is soaked and applied to the skin, as long as there are no open wounds or irritation. Cataplasm: It is traditionally made with milk. Prepare a decoction with 40g. of leaves boiled in milk. Apply directly on the affected area. Maceration of mullein in oil (unguentum verbasci): consisting of a maceration. Prepare 20g. of mullein flowers in 40ml. of extra virgin olive oil for 2 weeks. Shake each day once or twice, and keep in a place with sunlight. Strain into strainer or filter paper to remove the tiny hairs that the plant has, as they can be irritating. It is used at room temperature to treat hemorrhoids, ear pain and ear suppuration. It can be applied on the skin as an antibiotic and mild anti-inflammatory.